Life finds a way.” That’s the theme of ‘90s dino resurrection classic, Jurassic Park. Thirty years later, new technologies are being used to bring back the prehistoric past in remarkably realistic ways. At the vanguard of this rebirth is the award-winning Atlantic Productions. No matter what the challenge – 3D, VR, sophisticated visual effects or one-on-ones with the late Stephen Hawking, Barack Obama and regular collaborator Sir David Attenborough – Atlantic finds a way.Along with the BBC Natural History Unit, Atlantic is one of the few documentary producers who could be said to have a world-famous brand. Anthony Geffen started the company in 1992, just as Steven Spielberg started shooting Jurassic Park. The company’s strategy has been to push the envelope of what is possible in capture, distribution and exhibition technologies to bring factual content – especially natural history content – to new audiences in deeper and richer ways. “They’re brilliant, these big BBC series, but the danger is they all become very similar,” says Geffen. “You have lions and they’re beautifully filmed and they’re getting better and better. But I think we need to find new narratives. The production has rigged hundreds of cameras at every level of the rainforest, with the crew working on the forest floor monitoring the action for a whole month. The challenges they face include how to capture footage of a harpy eagle attacking a monkey, which requires rigging multiple light- and action-sensitive cameras in the forest canopy. One thing that has set Atlantic apart from other natural history producers is its in-house CGI team, Zoo VFX. 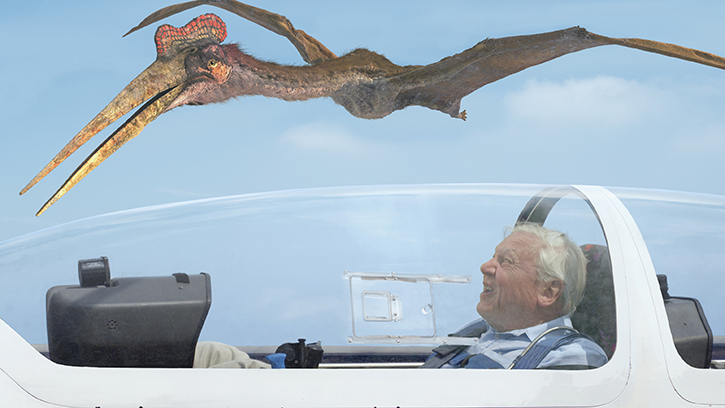 Zoo’s work includes bringing pterosaurs to life in Flying Monsters 3D, recreation of the primordial oceans in First Life, and animating the exhibits in the BAFTA Award-winning Natural History Museum Alive. “Zoo has an incredible skill base that rivals all the Hollywood studios like ILM or Pixar, but they’re used to working with things that are utterly factual,” says Geffen. Atlantic has both experience in wildlife documentary and CGI expertise in turning scientific theory into reality. It was this combination that got the attention of the Field Museum in Chicago when it wanted a large-scale animated presentation to accompany the new display of one of the world’s most famous fossils. Sue is the largest Tyrannosaurus rex skeleton ever found, as well as the most complete. Her new 5100 sq ft gallery opened in December 2018. The gallery features large screens projecting vignettes of Sue’s life, all animated by Zoo in collaboration with palaeontologists – incorporating the latest theories about T. rex anatomy and behaviour. The Atlantic animations are each rear projected at a custom resolution of 600×2160 pixels onto six large screens, each one measuring 125 by 270cm, along a 7m gallery. The scenes include Sue’s typical morning – waking up, having a morning drink and a munch on a dead Ankylosaurus, before performing her morning ablutions and walking off into the forest – which is a big hit with children. In another scene, Sue stalks a herd of Edmontosaurus. In another, there is the classic face-off with a Triceratops (if you’ve forgotten what a Triceratops looks like, see the cover on the previous issue of FEED). The Zoo team also worked with the museum to simulate the gait of an Edmontosaurus, using actual fossil footprints. Utilising the placement of the feet and the length of the stride, the Zoo team and their scientist collaborators used their CGI Edmontosaurus to accurately model what the dinosaur’s real walking would have looked like. It took around 30 run-throughs to get it right. 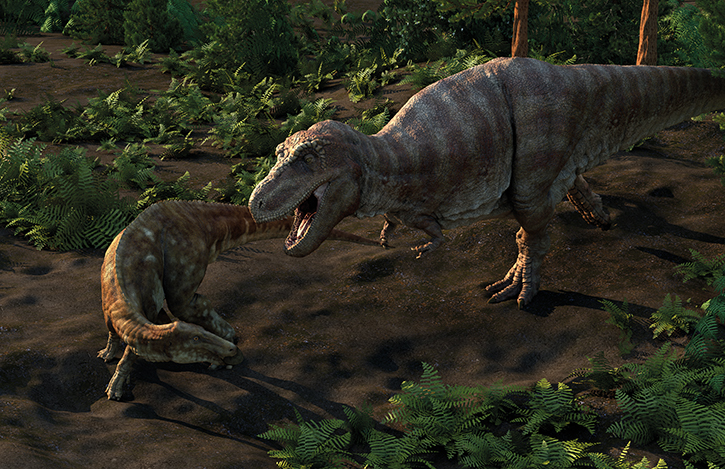 The animations are accompanied by soundscapes also created by the Zoo team – atmospheres and animal sounds designed to evoke the Cretaceous Period. The multiscreen exhibit has been a huge hit. Though Atlantic has been known for its VR and immersive natural history content, in this case, 2D screens in the proper setting have created a dynamic synthesis of CGI content and real-life experience. Smith confirms the excitement that followed the launch: “I witnessed a five-year-old stay for three rotations of the stories, running backwards and forwards following the T. rex with their finger as it moved around the screens. Yeah, it was quite brilliant to see that audience reaction.” It really shouldn’t be much of a surprise to see children excited by dinosaurs, but it’s not often that documentary producers get to see their audiences physically interacting with the content they create. Expanding the depth and interactivity of its documentary content is a continuous goal for Atlantic. Part of this strategy is to combine video, data and interactivity in new combinations to engage and educate audiences and provoke wider discussion. Documentary formats are undergoing changes, too. Geffen sees the possibilities for nature documentary streamed live or broken down into smaller, short-form pieces. Finding these new ways of engaging people becomes especially vital when the global climate is approaching so many cataclysmic environmental tipping points. One of Atlantic’s recent landmark programmes was a simple face-to-face interview, which looked at the importance of natural history education and the environment. Nothing too groundbreaking about that – except that this was Barack Obama interviewing Sir David Attenborough. At the other end, during the VR experience Great Barrier Reef with David Attenborough, Atlantic put up an interactive website that allowed millions of people to engage live with the state of the reef. They could monitor the Great Barrier Reef’s health and the robustness of its animal population and the surrounding oceans. From a company that won the first BAFTA for VR storytelling, we look forward to ever more engagement and continuing to fall in love with the natural world.